I got to the polls right when they opened on Election Day so I could spend the evening at a Brandon Sanderson reading and signing. The event was held at Weller Book Works, and it was my first visit to the new Trolley Square location. I got there early so I could browse and get a feel for the new layout. I’m glad I did, as it is a great set up and because Sanderson volunteered to field some questions before the event officially began. The appearance was to promote his latest release, The Emperor’s Soul, but he took questions on all of his books. He declined to answer some questions about the Wheel of Time finale, and one woman asked a question on grooming habits that he honestly couldn’t answer. Aside from that he was affable and generous with his time, taking more questions after the reading and soliciting questions from fans as he signed all of the many books put before him (I had him sign my hardcover copy of The Alloy of Law, as it has been awhile since I’ve been able to attend one of his signings). 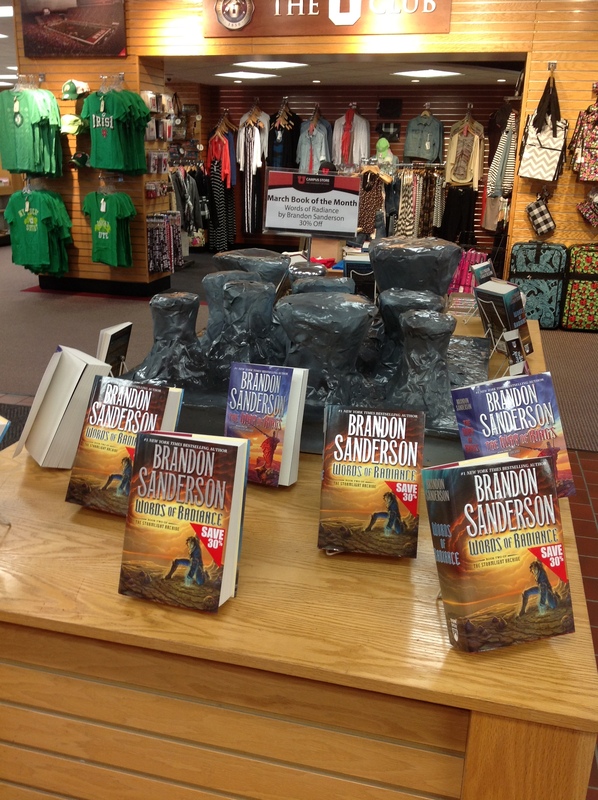 Sanderson is not only a popular author, he’s also a personable author. Completing Robert Jordan’s Wheel of Time series has been a tremendous opportunity for him, but doing so has taken a great deal of his writing time. He was concerned that 2012 would mark the first time he wouldn’t have an original work released since 2005, so he conceived The Emperor’s Soul on a trip back from appearing in Taiwan. He worked on it in the interim while A Memory of Light was in the final stages of editing, and it was released this month in a trade paperback from Tachyon Publications. When I learned of the book’s impending release I contacted Charlene Brusso at Tachyon to request an advance copy, which she sent along with Epic: Legends of Fantasy, an anthology that includes an excerpt from The Way of Kings, and Wonders of the Invisible World by Patricia A. McKillip. I got it signed by the author, and he numbered it #45. Although he was promoting The Emperor’s Soul, he did not read from it. Instead he read from the first draft of the second book in The Stormlight Archive! Now that AMOL is finished he has resumed work on his own mega-series, and we got to hear a section with a new viewpoint character! That was an exciting extra feature for attending the event; Sanderson really goes out of his way to support the brick-and-mortar stores in return for promoting his work. Customers who bought print copies of the book were invited to e-mail proof to Sanderson’s website to receive a free copy of the e-book; he isn’t shying away from digital editions, but he sees the two forms as complementary. Leading up to the event I listened to the audiobook version of Legion, a novella Sanderson published with Subterranean Press in August. 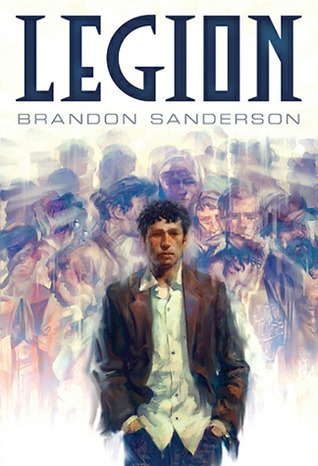 Because audible.com is a sponsor of the Writing Excuses podcasts that Sanderson produces with three other writers, the site is currently offering free downloads of Legion. I took advantage of the offer, and I enjoyed Oliver Wyman’s narration of the story. Legion is about a character with multiple personalities with whom he interacts, and Wyman performs all the voices distinctly without it being obtrusive. The story itself is brief, which is uncommon for Sanderson’s writing. He explained that he originally pitched the idea to Dan Wells, another member of the Writing Excuses team, before deciding to write it himself. It’s written as a pitch for a tv series, so it should be read not as a finished tale, but as a pilot episode. In that vein it succeeds, and I look forward to the series being created. I finished listening to Legion while waiting in line to have my books signed, so I switched over to an episode of Writing Excuses. It was slightly surreal to listen to a recording of Sanderson giving advice while waiting in line to speak with him, but I couldn’t get enough! 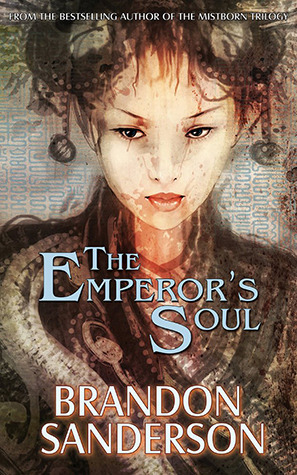 When that was over I began reading The Emperor’s Soul (not much in advance, admittedly). That made it difficult to concentrate on writing while waiting for the train, but, in the spirit of NaNoWriMo, I compensated. I was able to keep my word count creeping up and still find the odd moment to read, somewhat in the manner that the book was written. Inspired by a visit to a national museum in Taiwan, Sanderson created a system of magic that employs stamps that can rewrite the history of an object. What would happen to a person if their history was rewritten? And what if that person was the Emperor? Shai is a Forger facing execution for her crimes, but an assassination attempt on the Emperor grants her a stay of execution for 90 days while she replicates the Emperor’s soul. Sanderson’s magic systems always impress, but this shorter form forced him to leave out some of his own hallmarks, such as a prologue that showed a conversation between Shai and Hoid, an inimitable character who finds his way into most of Sanderson’s novels. He loved the scene, but it did not fit the story so it had to be cut. At the other end the story has no twist ending, which was hard for me to accept. Only when I listened to his explanation on Writing Excuses did I come to terms with the straightforward ending that satisfies the characters’ arcs. I rounded out my reading of his short fiction with the e-book Firstborn. Originally released as a Kindle edition in 2008, it was later re-released by Tor in a DRM-free format. I purchased it on my nook color and read it on an iPad. I’m not accustomed to reading on digital devices yet, but it was the simplest way of acquiring this particular story. 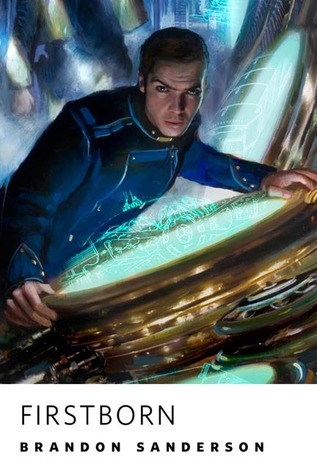 Firstborn is a different venture for Sanderson as well, as it is short form science fiction. It’s a story about a second son who lives in the shadow of his older brother’s burnished star. The firstborn is a military genius with an unblemished record, while the younger brother has nothing but blemishes and blunders on his record. That won’t cut it for the son of a High Duke; greatness is thrust upon him, only to slip out of his hands and shatter on the floor. He tries to live up to the expectations, but he knows his own limitations. Is it possible he might know the limitations of his unbeatable brother, too? This story does have the twist ending I’ve come to expect from Brandon Sanderson, and he never disappoints. 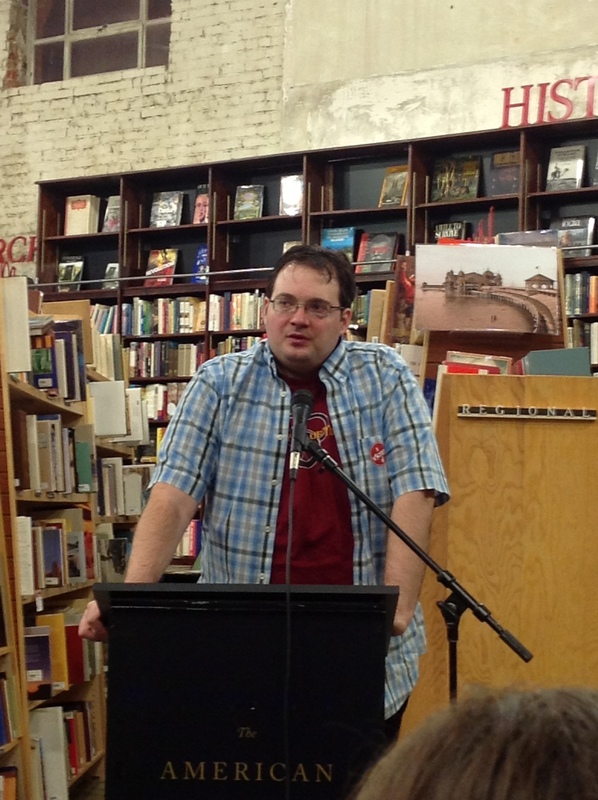 High fantasy has a new standardbearer in Brandon Sanderson. Like the pair of figures on the cover by the incomparable Michael Whelan, he stands on both sides of the divide, simultaneously completing Robert Jordan’s Wheel of Time series while launching his own mega- series, The Stormlight Archive. The first book in the series, The Way of Kings, is truly a tome in the Middle French/Latin/Greek sense of the word. From the prelude to the Ars Arcanum more than a thousand pages later, this is a massive book, both in size and in scope. The publisher Tor is committed to developing an author’s career, and the support behind this ambitious work with its Whelan cover, close to 30 interior illustrations, and hefty page count heralds a prodigious career for Sanderson. The prelude opens with the Heralds, incarnate representatives of the Almighty, abandoning their posts as protectors of mankind. The subsequent scene, the assassination of a king, occurs some 4500 years later. Chapter one follows five years after that prologue. This is a world (and a book) steeped with history, mythology, and religion. Along the way Sanderson incorporates culture and caste, ecology and economics, philosophy and politics. It is a complete world, attesting to the depth of Sanderson’s imagination. The world of Roshar is beset by highstorms, or worldwide hurricanes, which rise repeatedly yet irregularly. The planet’s wildlife has adapted accordingly, producing skyeels and retractable blades of grass. Roshar’s human inhabitants are accustomed to the highstorms, but their innate tendencies aren’t as malleable. For every unusual species of flora and fauna there is a common human foible. The planet may be alien, but its people are flawed humans with recognizable traits. This combination of a highly inventive yet fully realized world with original yet identifiable characters is the source of fascination in Sanderson’s writing. Stormlight is the source of magical attributes in this series, hence it is The Stormlight Archive. Gemstones infused with stormlight can be used to power anything from spanreeds to Shardplate to Surgebinding. How does it work? As extensive as The Way of Kings may be, it is still the first book of a lengthy series so a reader cannot expect to have a thorough understanding, although Sanderson’s magic systems are always well-grounded. His characters may or may not be well -grounded, depending on the individual character, but Sanderson’s characters are always well-motivated. The Way of Kings concentrates on three principle characters: Kaladin, Shallan, and Dalinar. Kaladin is so gifted with a spear his men call him Stormblessed. His prowess in battle leads not to glory but to slavery. Shallan is a clever young woman who ventures far from her family’s estate to petition a renowned scholar to take her on as her ward. Dalinar is the brother of the assassinated king, a fearsome warrior who seems to be losing his edge in combat and in his mind. These characters never deviate from their motives in spite of the tremendous impediments they encounter. Sanderson is a terrific worldbuilder and an intricate plotter, but his true achievement is in the characters who navigate both. A novel/series of this magnitude requires a host of such characters; an abbreviated list would be a worthwhile addition to the Ars Arcanum. There is a great deal to keep track of in this book, and appendices are welcome. The Way of Kings is Sanderson’s best book yet, but Tor held off publishing it until after the Mistborn series for good reason. It would be a daunting first-time read. Devoted readers of Robert Jordan, Frank Herbert, and George R.R. Martin would find familiar footing here, but those who are new to epic fantasy should begin with one of Sanderson’s earlier works before attempting this summit. The journey must come before the destination.